Verlon capped off the season with another World Champion trophy to add to his growing collection. 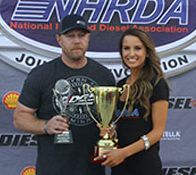 He grabbed his third win in a row by defeating Dan Weaver, who had won the Texas Diesel Nationals earlier this year. Congrats to Verlon and the entire team!